Business Coalition for Justice Founder and Former House of Delegates Candidate Debuts Album of Hymns and Spirituals at the Robinson Theater in Church Hill, Raising Funds for the Richmond Community Bail Fund. 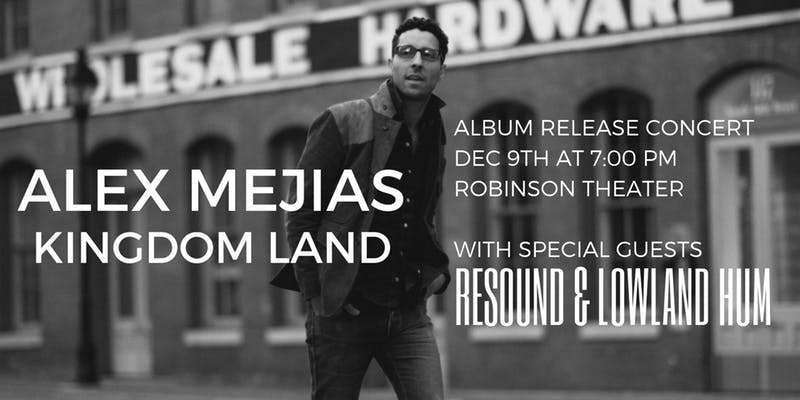 On December 9th at 7PM at the Robinson Theater in Church Hill, Alex Mejias will perform songs from his forthcoming album Kingdom Land, set to be released on November 9th. Mejias will be joined by local gospel sensation RESOUND and folk troubadour husband and wife duo LOWLAND HUM. All proceeds from the night of music will be donated to the Richmond Community Bail Fund, a non-profit organization that provides free bail to individuals awaiting trial in the Greater Richmond region. Alex Mejias returns to the stage after a long hiatus from writing and performing as both a singer-songwriter and frontman of High Street Hymns, a Charlottesville,VA-based hymn project that has reached churches across the U.S. and beyond. Mejias, an attorney and business strategist, now focuses his extra time on community-based projects such as serving as the President of the Business Coalition for Justice (the “BCJ”), a non-profit association of businesses working together to raise awareness about and combat the structural causes of racial inequity in the U.S. In the summer of 2017, the BCJ launched the Richmond Community Bail Fund, which provides free bail for individuals facing trial in Richmond and Henrico County. Tickets are $10 and will be available at the door and online at https://alexmejias.com. The first single, “Kingdom Land (I’m On My Way)” is available now in digital outlets at http://smarturl.it/kingdomland and on YouTube at https://youtu.be/uHaz2mmsUeg. For more information about Kingdom Land, visit https://alexmejias.com/epk. For more information contact Jasmine Lowery, agapeloveeventsrva@gmail.com, (757) 334-3238. Ron Swann. This seems like a good event. Free bail? Can someone please explain what this is and how it works?